Need more information about booking Home 1371275 ? "Bonavanti" has been called the best view in St Francis, the best view in the Eastern Cape and even best view in South Africa!!! Bonavanti is perched above the famous surf spot Bruces, overlooking the bay of St Francis. The luxurious house was recently renovated and updated with beautiful finishes. The house has 4 bedrooms and 3 bathrooms and 3 outdoor showers. The house encourages outdoor living as all living area doors slide open fully to catch the most beautiful view of the sea. 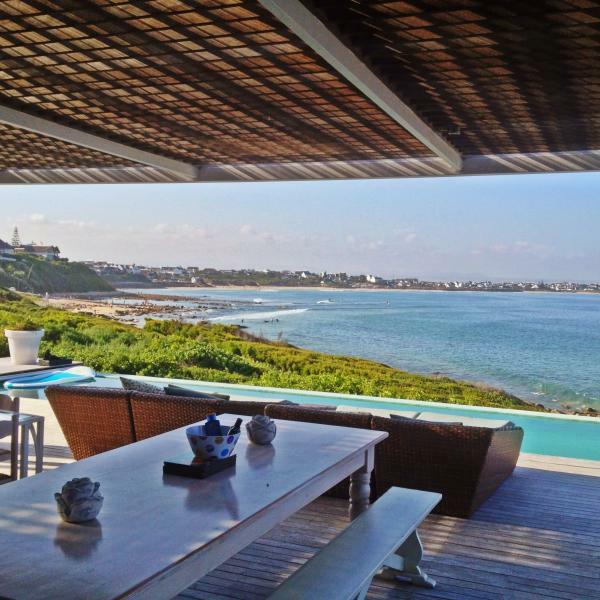 Outside there is a large patio with a covered dining area, built in braai (barbecue grill), and sun loungers. The patio leads to a refreshing solar heated infinity pool. The ocean below is accessible through a private little path that leads down to the rocks. It is not only ideal for swimming and surfing, but also fishing, and lengthy strolls along the waters edge. St. Francis is known for its quiet canals, huge lagoon and beautiful beach. It is a paradise for families and water-sports enthusiasts. It boasts white sandy beaches and ideal conditions for surfing or water-skiing in the river. Dolphins, otters, and whales can been seen in the bay from the house. You can get in touch with Lila (the owner) through the contact form on this page. Send Lila (the owner) an email through the contact form on this page. Alternatively, if there’s a phone number on this page, you can call them. How do I contact Lila (the owner)? If you’ve already booked, go to Manage your holiday booking to view Lila the owner's contact details or send them a message. Or send Lila (the owner) an enquiry through the Contact the owner/manager form if you’d like a quote or more info first. When you pay online through the Book your stay form, a booking request is sent to Lila (the owner). You’ll find out within 24 hours whether they’ve accepted - no money will leave your account before then. You can also request a quote from Lila (the owner) through the contact form. The owner will email you the total cost for your dates and a link to book and pay online. Use the Book your stay form to pay provisionally online. You can pay by credit/debit card or PayPal. Lila (the owner) will have 24 hours to accept the booking and no money will leave your account before then. Why can't I call Lila (the owner) before booking? You’ll need to contact Lila (the owner) to do this. Send them a message in Manage your holiday booking or through the contact form on this page. You can request to change the dates or number of people on your booking via the Manage your holiday booking page. To change your holiday dates use the Edit booking button. If you need to change the number of guests staying then send Lila (the owner) a message. If Lila (the owner) agrees, they’ll send you a revised quote outlining the changes. You can review and accept/decline this from the Manage your holiday booking page. You’ll have 48 hours to take action before the revised quote expires.